This wild fire crisis is similar to the crisis at the border just easier to fix because there is a bipartisan proactive plan that is ready to roll. 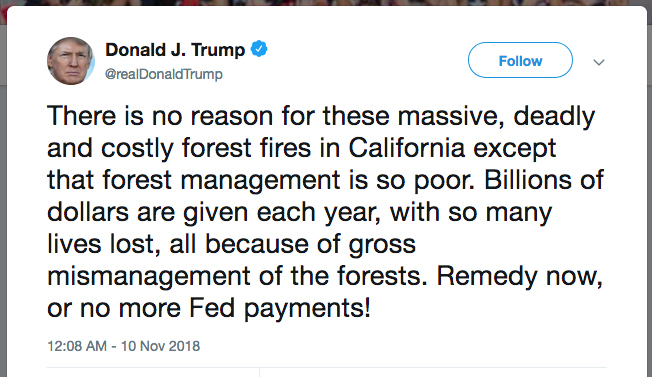 As fire experts we agree with the President on the California funding sink hole just not that it’s a forest problem. After living out here fir 45 years and being a resilient fire expert the problem is not the burning forests it the dry matted fuel on hillsides all around our communities that have a rat screen attic ventilation design flaw. My plan addressed both and if adopted the sink hole is fixed and until new proactive chemistry slows the advance of dry matted fuel we lose more homes in 2019. The problem is until there is a Wild Fire Summit called and vetted there will be no change it’s controlled by the fire fighters. Big loss is coming if a proactive new wild fire plan is not adopted. Historical loss of homes plus California’s wildfires are releasing millions of metric tons of carbon into the air so add those two up and for some it’s as big a crisis at the border only difference there is a solution if the administration steps in now. WASHINGTON — President Trump said he is cutting off FEMA funds for California wildfires. .The proactive wild fire defense plan has more testing than the red retardant chemistry being dropped from planes now. In a side by side ASTM E84 the Red Fire Retardant being dropped from planes would lose against the newest safest award winning American Innovation chemistry that is ready to help and is blended right here in California. Fire Fighters are not the only wild fire experts and until other experts are heard we are going to rack up more historical losses. A good proactive wild fire plan had two parts and both are proactive in solidarity with our government to defend it from future losses.